Love Rocks has shortened over the last 24 hours to enter the Lough Neagh Stakes as the marginal favourite ahead of the Kent Fleming-trained Lucky Hussler, winner of the George Moore Stakes a couple of weeks ago first up. The field of fourteen is a very competitive one, however, with six of those runners going out at 11.00 and lower, indicating the relative difficulty in picking a tear away from this pack of runners. 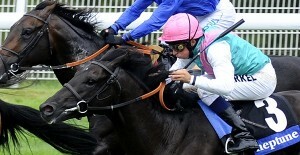 The best place to have a bet on the 2013 Lough Neagh Stakes is with Bet365.com. The odds below were taken from the site, and you will be able to find the latest race odds there as well. Bet365.com is also offering each-way betting on the race, with which you will receive 1/4 if should your selection place in positions one to three. Often the indicator of form leading into the Lough Neagh Stakes, the Group 3 George Moore Stakes, saw a first up Lucky Hussler narrowly beat the Doughty-trained Morning Captain and Startsmeup into second and third respectively and, despite having to go up in weights to 56 kg, the start from barrier four should afford jockey Michael Cahill some options in the 1350-metre race, a distance that will suit the four-year-old to perfection. The current favourite for the $175.000 race on Saturday, the Steve Tregea-trained Love Rocks, is after his third win in a row after the four-year-old brought home big victories at Eagle Farm and at the very same Doomben track the Lough Neagh will be run on within the last month. He will have to deal with a significant jump in class for the race on Saturday, however, though the 54 kg he brings into the race and a start from barrier six will bring him into the race nicely. Morning Captain is another to look out for, as Kelly Doughty looks to steer the horse she and her husband bought for a mere $3,000 to half a million in career earnings. The pick is not without merit either, as the five-year-old enters the race on form. After two close second-place finishes over 1200 metres, Morning Captain returned to victory third up over 1300 metres at Eagle Farm, before finishing a close third in the Listed Keith Noud Handicap in a month ago. He looked good in his narrow defeat to Lucky Hussler in the George Moore, and the consistent galloper must be kept in consideration for his second stakes victory. As mentioned above, the best racebook to place a bet on the 2013 Lough Neagh Stakes is Bet365.com, who will offer the best odds on the race. When visiting Bet365.com, click on ‘Horse Racing’ in the left sidebar and scroll down to the Antepost section of the page, where you will find the markets for this race and many more. The Lough Neagh Stakes is a listed race run at Doomben Racecourse over a distance of 1350 metres. The race has a purse of $175.000, with over $100.000 going to the winner.